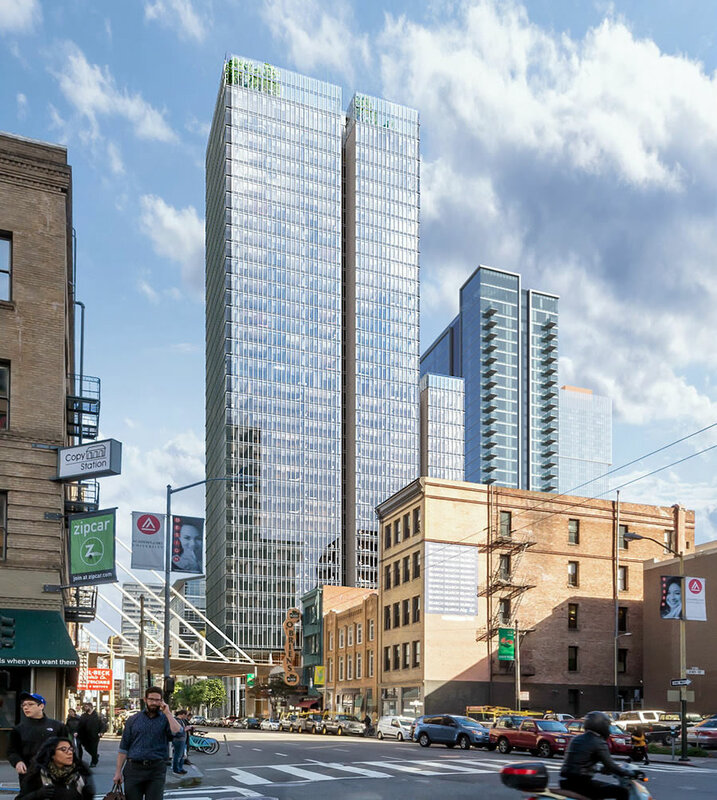 While the approval process for a 36-story tower designed by Renzo Piano Building Workshop, in collaboration with Mark Cavagnero Associates, to rise up to 405-feet in height at 555 Howard Street was, in fact, fast-tracked by Planning, and the development was approved back in early 2017, the project has yet to break ground. Of course, in order to break ground, the detailed blueprints for an approved project need to be checked by numerous different entities, including the city’s Fire Department and structural engineers, and an actual building permit needs to be approved and issued, perhaps with a heightened level of scrutiny considering the attention another nearby tower has received over the past couple of years. And while the aforementioned engineers have yet to give their final approval, San Francisco’s Fire Department and Public Utilities Commission have recently signed off on a thrice revised set of plans and a building permit could soon, at least relatively, be approved along with a demolition permit to clear the site for construction. Championed by Pacific Eagle Holdings and SKS Partners, the 555 Howard Street tower is slated to yield 69 residential condos over a 237-room luxury hotel, with a quadruple height lobby fronting Howard, a ground floor restaurant, a sky bar on its 36th floor and a rooftop public open space above. And while the building permit for the tower has since been approved, the project team is now seeking approval to scrap the condo component from the development and simply build a 406-room hotel, with one (1) off street parking space and a storage room for 20 bikes. We’ll keep you posted and plugged-in. Totally fine with this. I’m about as pro-housing as it possibly could get, but the select trophy units at the top of buildings like this or 181 Fremont are not remotely helping our crisis like the large scale rental buildings are like Trinity Plaza, the proposed 984 unit Honda Dealership, etc. We’re also seeing a shortage of hotel rooms. Drastic shortage actually. A friend of my wife’s does large scale events for most of the huge conferences at Moscone and when they have to hire temp workers to staff those events, the only hotel rooms they can find for them are in San Bruno. So I’m beyond supportive of all the proposed hotels here and in Union Square/Mid-Market. I’m just bewildered that even when “fast tracked” that it’s taken so long to get their permits. If our system could respond more nimbly, we’d have many more projects going that were no longer economically feasible after the years it took to get approvals and permits. Nobody should be “bewildered” over SF’s glacial approval process, It’s how the system is designed and we need to change it. Sorry — bewildered is more rhetorical in this case. I expected nothing less. Not sure it makes sense without at least some guest parking spots. Lots of hotels in the city have no guest parking. You honestly don’t need them in an urban, transit-rich core. I’m as pro-car as anyone who posts on this site, but I’ve got to say if there is anywhere in San Francisco where a hotel doesn’t need parking, this would be the location. As long as they have somewhere where a delivery truck can park and where cabs do drop-offs and pick-ups, they’re good. The burning question is: who gets the 1 parking space? Now honestly does anyone else here think that development is out of scale with the neighbors? How I wish Herb Caen was alive. Across the street from a parcel zoned for 800+ feet and one zoned for 500+ feet. A block away from 181 Fremont at over 800 feet tall. A block in the other direction is the LinkedIn building at 370 feet tall. Directly behind it is 33 Tehama at 360 feet, and then two condo towers on Folsom about 500 and 600 feet tall under construction. In the middle of the Transbay District which already has a 1000+ foot tower and another proposed that will feature a 900+ footer and a 600+ footer, not to mention a good half dozen 300-600 footers on the parallel block of Mission. So yes one might say that it’s out of scale with its neighbors in that its a bit shorter than many of them. Well, yes, it is significantly taller than the handful of dull and dreary buildings on the corner, but it is within a block or so of several high rises. It is located downtown, and if you are going to build tall buildings that is where they belong. As for Herb Caen, he has been dead for over 20 years. He was a witty curmudgeon, but I am not sure speculation of what his opinions would be matter much as far as what happens in 2019. Let’s stay in the present. Thanks for your comment! Seriously, how long do we have to live with this anachronistic fealty to Herb Caen and all things Victorian. Cities change over time, like all human and natural things, yet a large portion of our population holds onto the Victorian and Mid-Century past of San Francisco architecture and planning. And what has that given us? 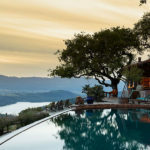 I don’t need to repeat the commentary of others but the shorthand gives context, unaffordable housing for most but a select few, underutilized urban spaces and mass transit resulting in sprawl and environmental degradation, and tax policies that benefit a select number of commercial and residential owners to the detriment of our shared government funding for infrastructure and schools. Oh and finally, those of you who like to give Caen kudos for his “Don’t call it Frisco campaign” are buying into the old privileged white guy vision of a City only for them. Ask the majority who don’t fall in that category about this and that’s enough of a denial of the policies of the old for me! Some of those (admittedly handsome) neighbors are coming down anyway when the train tunnel gets connected to the transit center. In lieu of Caen’s disdain for the term “Frisco”, we might want to keep linguistic distance from Frisco, TX, a suburb of Dallas. While I’m sure it is a fine place, it makes Stockton look like a trove of historical resources. Bravo well said Jeff! This thing should be 800ft….and btw talk about how cities change and evolve just look at London. I love the old castles, gothic feel, ancient walls, old cathedrals and squares, cobblestone streets, mixed in with modern tech, crazy multi level subways, things like the eye, and huge hi rises. This is good, diverse and evolving. go SF! Build it up! (Oakland too!) And make that 2nd tube already. 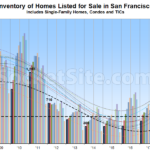 Condos don’t pencil now in SF. The large drop in new development proposals in 2018 – and already continuing into 2019 – attests to that. No major new office developments have been proposed in a long while. Hotels are the safe bet, financially, right now. This re-mapping was dictated by the current economic, in terms of development, situation in SF. Nearby, 542 Howard has been abandoned. Originally conceived as a skinny 48 story condo tower – though an alternative plan envisaged a half condo/half hotel project – whomever eventually purchases the entitlement will likely go forward with a much scaled back all-hotel project. I guess we’ll find out with central soma which has an even higher affordable housing requirement compared to the rest of San Francisco. Plenty of these projects are in the pipeline, we’lol see it construction commences on approval. So if you decide to “drop condo’s from permitted plans” at the 11th hour, do you need to get another permit for all the plan/ document changes? Its not like switching paint colors. I’m curious if somebody can shed light on what this change means to the approval process- both planning and building. Absolutely, it’s called a revision permit. Not likely to trigger structural changes, but review by Planning will be essential to the change, then DBI as well. Aren’t there special requirements related to hotels? Shouldn’t they need to update entitlements to remove condos and add hotel rooms, if in fact they are increasing the number of guest rooms? It’s not just a matter of building permits. Back to Herb Caen… to me, his most memorable thought went something like this: ‘San Francisco was at its best the day you first arrived’.